For the past few days my energy and thoughts have been around RESPECT. What decisions are we making in our lives that supports us, that shows that we have respect for ourselves? 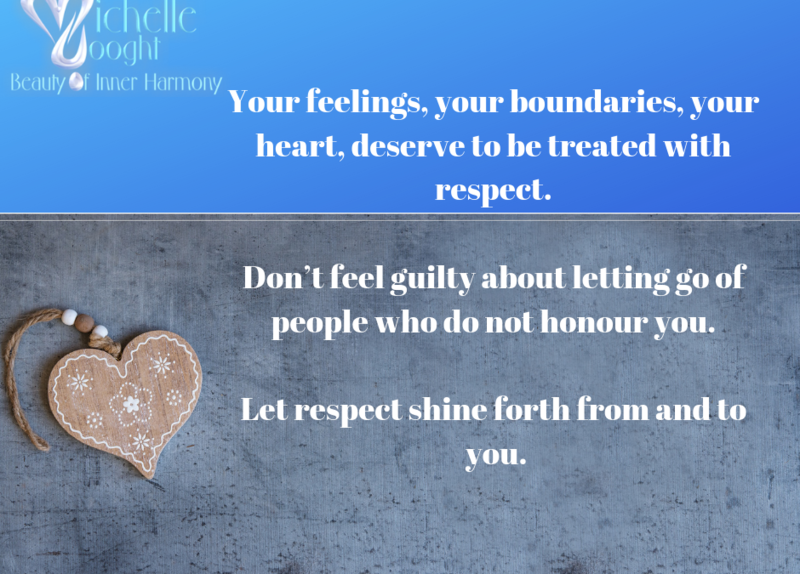 Often other people’s behaviour leaves us feeling disrespected – if this is so, do you feel you have honoured yourself enough too? In turn, do we treat others with respect? Do you feel you have been disrespected? Do you feel angered and humiliated as if your opinion doesn’t matter? Respect is similar to love. It creates a higher understanding of unconditional love when we respect ourselves and others. You ARE respect. Do not compromise on this. You are a divine and unique child of God and the Universe. Is this not enough reason to respect yourself and open up to the unconditional love and respect of the Universe? And in turn then, reward the same to others? If the Angels and Guides respect you enough to only appear when you ask, how much more should we, as one another, respect ourselves and all living beings? Receive respect into your own heart and it will radiate out to others. When you feel trampled on and disrespected, move away from the people and circumstances that cause this. Sometimes we may even have to clean up the fear and inner anger that make us lash out at others in a disrespectful manner. Your feelings, your boundaries, your heart, deserve to be treated with respect. Don’t feel guilty about letting go of people who do not honour you. You are respect; be this. Be kind, be understanding. Be of lesser judgement. Let respect shine forth from and to you.